Why do I have acne now? All acne is caused by a hormonal imbalance. These hormones impact the sebaceous glands, which create sebum, the oily substance that hydrates and moisturizes the skin. Too much sebum can combine with dead skin, dirt and debris to clog pores, leading to acne breakouts on the surface of the skin. For teens, the hormonal changes triggered during puberty can cause the sebaceous glands to go a little overboard, which typically results in an oily complexion, especially in the t-zone (forehead, nose and chin.). And in many cases, this hormonal imbalance can affect those sebaceous glands well into adulthood. And for some, you may not have even had acne as a teen but got it as an adult. The medical community is still unclear as to the exact contributing factors, but believe that the following can cause this imbalance which leads to acne in adults: lifestyle, genetics, diet, stress, pregnancy, oral contraceptive use, excessive stress or exercise, fitness stimulants, perimenopause, menopause or use of certain medications. The effects happen internally over time, much earlier (and more subtle) than you may think. What can I do to treat my adult acne? You don't have to feel hopeless at this point. Long lasting clear skin can be achieved with the right tools. Most topical acne products are formulated to zap excess oil that tends to collect on the surface of the skin, leaving the source of the problem untreated. Most people with adult acne have combination skin, rather than exclusively oily skin, and the chemicals used to give teens a squeaky clean complexion are often too harsh for adult complexions and result in dryness, flakiness, and an increase in sebum production, all of which can lead to more acne. So here are some important points to walk away with as you begin to adjust your skincare regimen. Cleansing. Making sure not to overdry your skin, limit washing your face to morning and night, using clean hands and lukewarm water. Look for a gentle non-comedogenic cleanser that won’t strip the skin of moisture. Those with mild acne might even be able to skip the acne-formulated wash every other day or two, replacing it with a less abrasive exfoliant that won’t dry you out, such as glycolic acid. Again, the idea here is not to dry out your skin with over-drying products (which can also lead to aging of the skin) - this creates more flaky skin and debris that will get into those pores, creating more breakouts. Moisturizing. Because adult skin tends to run on the drier side, staying hydrated and moisturized will ensure that your skin is properly soothed from the inside, out. Depending on the severity of your acne, you may not need to use a medicated moisturizer every single night, instead alternating with a non-comedogenic formula to properly hydrate the skin and pores. As with any self-care practice, always be sure to drink plenty of water, and get those fruits and veggies in to ensure a healthy glow. Spot treatments. Many over-the-counter spot treatments rely on super-strong acne fighting chemicals such as benzoyl peroxide to banish blemishes, which can be really hard on adult skin. A clay or sulphur based formula may be much less harsh and even healthier for the skin. Please keep in mind however, these products are designed to help with symptoms, not break the cycle! Because acne is attributed to a hormonal imbalance, the only real way to treat the problem is to target it at its source. 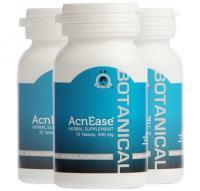 This is why our AcnEase® users love our product because it does just that – it breaks this endless cycle and achieves sustained results all while using botanical ingredients without the drying and irritating side-effects that antibiotics and external ointments (often containing benzoyl peroxide or salicylic acid) can contain. 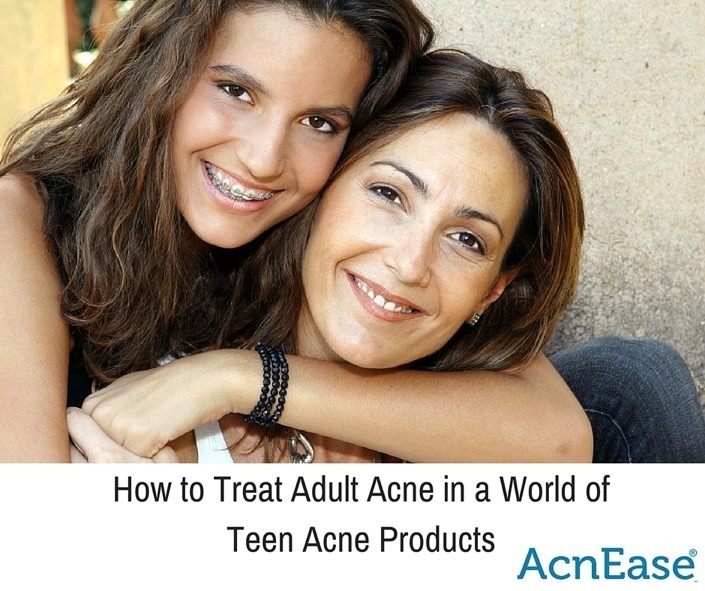 If you are experiencing a “return” of an acne problem from your teen years, you may be tempted to treat it the same way as you did in your teen years, and for good reason. But as you can see, understanding the skin you're in, and how it changes over time, is an important part of choosing the right skincare regimen, in order to effectively treat the problem without worsening symptoms. We want to hear from you. What do you do to treat your adult acne? Tell us in the comments below!